These Farm Heroes level 245 cheats and tips will help you beat level 245 of Farm Heroes. 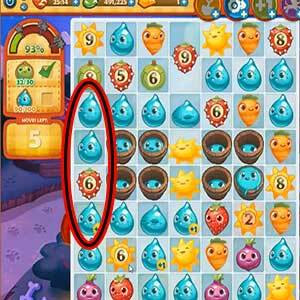 The objective of Farm Heroes level 245 is to collect 30 apples and 100 water drops in 28 moves. 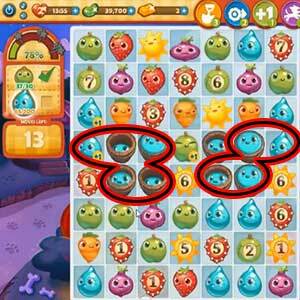 In this level you will notice a large amount of water buckets in the center board, concentrate on making matches with these first so you can open up your board more with other crops. Ticking crops, while they can be frustrating to clear, when they are combined with a 3 regular crops can eliminate a large amount of whatever is around them. This comes in handy if there are other blockers or ticking crops next around them. Level 245 Cheat #3: Do not forget the goals of the level! Do not forget the actual goal of the level. Make sure you collect 30 green apples and 100 water drops. 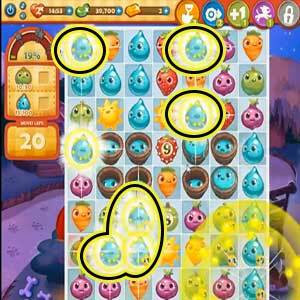 Towards the end of this level when you combine the water buckets together you will notice multiplying water droplets all over your board.